Few authors do contemporary pulp better than Sussex-bred James Lovegrove. Maybe Lovegrove’s talents have something to do with his ancestry. After all, as he says in the Preface to Sherlock Holmes and the Sussex Sea-Devils, the surname Lovegrove is only a few letters removed from Lovecraft, as in Howard Phillips Lovecraft of Providence, Rhode Island. The creator of Cthulhu was an arch-WASP and often bragged about his pure Anglo-Saxon ancestry, so maybe Lovegrove’s tongue-in-cheek Preface is actually right on the mark. This genealogy aside, Lovegrove’s latest and final installment in his The Cthulhu Casebooks series is a gem of a story. Like the previous two installments (Sherlock Holmes and the Shadwell Shadows and Sherlock Holmes and the Miskatonic Monstrosities), Sherlock Holmes and the Sussex Sea-Devils bends and twists genres, specifically horror, detective fiction, and espionage fiction. In this elephantine and eldritch tome, Watson and Dr. Holmes once again battle the vile Outer God R’luhlloig, who for years donned the human mask of Professor James Moriarty—Holmes’ greatest human adversary. Now, in 1910, R’luhlloig has possessed Baron Von Herling, the German ambassador to the United Kingdom. Given R’luhlloig’s choice of human vessel, Holmes and Watson’s old battle takes on an international importance in this novel. Von Herling not only has Kaiser Wilhelm II’s ear, but he also has access to a state-of-the-art submarine, the SM U-19, which he hires to take him and his British captives to the South Pacific and the legend-haunted city of R’lyeh. Here, in the cyclopean city of stalagmites, the Great Detective and his Boswell must overcome a battle of intergalactic proportions. Sherlock Holmes and the Sussex Sea-Devils is a loving homage to both Sir Arthur Conan Doyle and Lovecraft. However, the person really worth praising here is Lovegrove, whose writing is flawless and roars like a cozy winter fire. 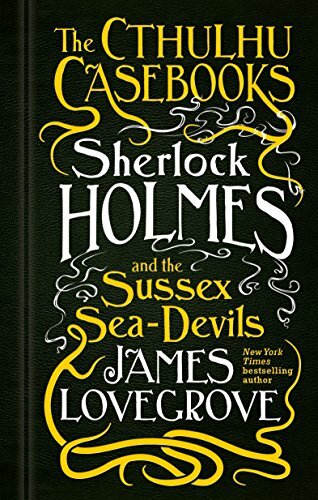 Mr. Lovegrove’s storytelling skills are undeniable, and Sherlock Holmes and the Sussex Sea-Devils really does feel like a long-lost Holmes story from the Great Detective’s golden retirement as a bee keeper on the Sussex Downs. Lovegrove’s Watson is a breath of fresh air too, as he is neither a buffoon nor doddering old man. Rather, Lovegrove’s Watson is like the original—a Victorian gentleman of the middle class with a streak of toughness earned in the harsh Afghan dirt. As for the villains, R’luhlloig is a dastardly heel that is actually more Moriarty than extraterrestrial deity. Most of the Germans are pre-World War I stereotypes, and their machinations in the Sussex village of Newford is something straight out of Scooby-Doo. This does not harm this novel, but rather adds more punch and fun. If nothing else, Sherlock Holmes and the Sussex Sea-Devils is perfectly ridiculous. Lovegrove’s final installment of The Cthulhu Casebooks is a must-read for all speculative fiction fans. It is also a must-read for all those you love good yarns, or those who like having a big book to curl up with on a cold night by sea.